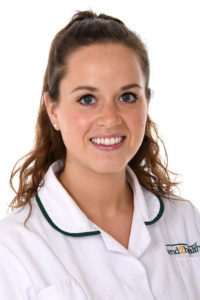 Ginelle is a friendly and supportive osteopath whose main aim is to help decrease the pain that her patients are experiencing whilst also ensuring that they fully understand the cause of their pain and how the treatment will help them. She promotes osteopathy as an excellent way of treating musculoskeletal and visceral symptoms as well as a method of preventing them from reoccurring and has so far succeeded in helping many people throughout all stages of life. Ginelle’s passion for osteopathy began at the age of 13 when she herself experienced the tremendous benefits that osteopathic treatment can have on all areas of the body. Having graduated with a masters in Osteopathic Medicine she now wants to show others how osteopathy can improve their quality of life and wellbeing. Ginelle has a keen interest in ante/post-natal treatment, sporting injuries and in helping patients cope with the natural processes of degeneration. She is fully qualified in acupuncture, dry needling and kinesio taping, meaning that her treatment plans can be tailored uniquely for each patient using a wide variety of technique approaches.